The clocks might be ready to spring forward, the temperatures dancing at higher levels and the sun starting to shine for more days in a row. But as much as we think spring is around the corner, in those parts of the country waiting for winter's end, it doesn't mean we're ready for full-on race mode, especially when it comes to triathlon. Unless you're part of Open Water Chicago, where the water and weather temperatures never seem to deter anyone from taking a Lake Michigan swim, chances are you won't be doing much outdoor activity except for running until spring really has sprung--maybe even summer. Whether you have an early season race--St. Anthony's, Ironman 70.3 California, REV3 Knoxville or any others--or simply want to keep your training in check, you can still get into race mode before the ground completely thaws. How? 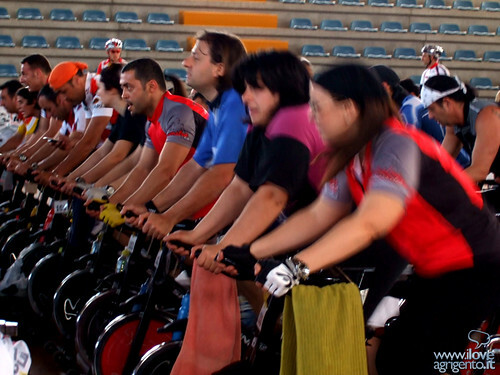 With an indoor triathlon, where you'll swim, bike and run for either a set time or a set distance, depending on the race. And the latest and greatest indoor tri to hit the scenes is through Equinox Fitness Clubs. Race registration only costs $25. That's less than any outdoor race which can easily run over $100. That registration fee goes completely to The Heroes Project, a charity that was started by Equinox member Tim Wayne Medvitz to help injured soldiers rehabilitate their bodies, reinvigorate their spirit and reclaim their independence, all by training to climb the world's most spectacular mountains. The race distance is almost the same distance you'd cover in a sprint triathlon. You'll swim 500 yards in the pool, then hit 10 miles on the stationary bike, and wrap everything up with a 3.1-mile run. You don't need to be a seasoned triathlete to try this race. Indoor tris are a great way to test your triathlon waters and see if you even like the sport before committing time and money to training and gear. The afternoon race start let's you sleep in on a Saturday--in Chicago, anyway. And my personal favorite: if you're a top finisher, you score big with a race entry into the hard to enter Escape from Alcatraz Triathlon in San Francisco. The details: the 75 top finishers are each guaranteed one of the 2,000 registrant spots available for the Alcatraz event. And the 25 Equinox employees who place highest in the indoor tri will also be offered Alcatraz invites. Talk about a great goal to shoot for, especially if you're fast at shorter distances. Tons of people enroll in the lottery for that tri and tons are shut out, and now you have a chance to get in. And race at the same time. Who's up for participating? Check with your local club for schedules and available spots before it's too late. Photo grabbed from iloveagrigento.it at flickr.